Our Mediterranean Glory Bowl is a seasonal recipe; pomegranate season. I have a sentimental love for pomegranate and to a fault may include them in one too many recipes. Thanks for hanging in there with me. I have a favorite holiday dip/salsa recipe that I prepare every year. 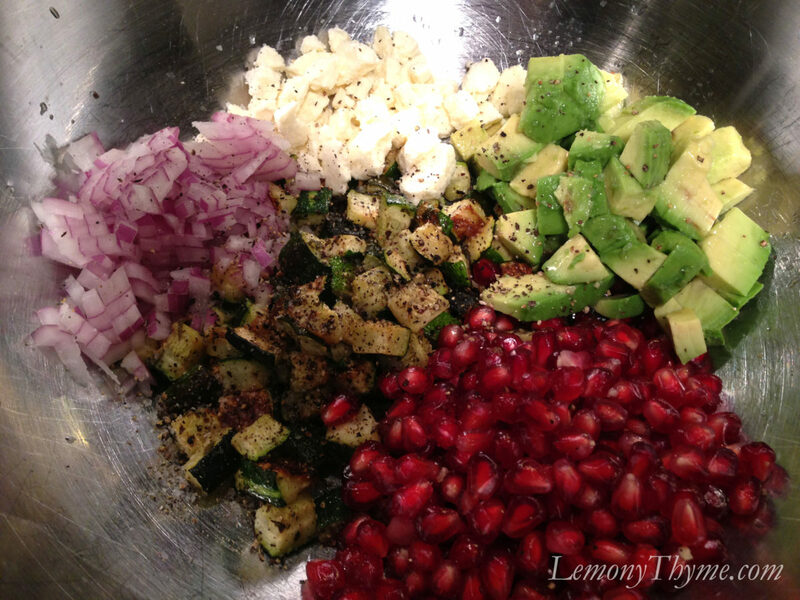 Pomegranate, Zuchinni & Avocado Salsa is Mediterranean flavor love…in it’s GLORY. Thus the name of this Lunch Bowl. I added sweat Italian chicken sausage and farro for a burst of protein. I’ve bragged on Farro before. I was studying the bulk bins at my local Whole Foods Market looking for something different. I was charged up to discover that Farro is packed with goodness. Farro is one of the oldest cultivated grains and has been consumed for over 5000 years. With 8 grams of protein and 7 grams of fiber per cooked cup, Farro is an energy power house. Because it’s a complex carb, Farro breaks down slowly, helping to stabilize your energy over longer periods of time. Farro is high in B vitamins and minerals, especially Magnesium which has been said to ease tension and menstrual cramps. And the best part, Farro tastes great and is super versatile to use. I think you’ll love it’s slightly chewy nutty flavor. Now combine all those health benefits with the pop of fresh oregano roasted zucchini, sweet pomegranate, creamy avocado, sharp feta, savory chicken sausage, with a generous squeeze of lime juice. Mediterranean Glory Bowl for breakfast, lunch or dinner for me!! Toss zucchini with olive oil, oregano, and salt & pepper. Spread in a single layer on a baking sheet, along with sausages. Roast, tossing once, until golden brown, about 25 minutes. Meanwhile, prepare farro according to package instructions. To prepare bowl make a bed of salad greens and cooked farro. Add a spoonful of each remaining ingredient, including sliced sausage. Squeeze lime juice over top. Serving size = ¼ recipe. 9 WW Pts+ per serving. This looks delicious! I love simple delicious flavors and could enjoy a bowl of this for any meal. I love farro too! It has every component of happiness!! I knew the picture was gorgeous (as usual) but I had to come over and see what a Glory Bowl is. Now that I read the recipe, I understand where the name comes from.